How Do I Check Condensate Drainage on a Bryant Furnace? Condensating furnaces are fantastic until the condensation lines start to get clogged. Over time, sediment builds along the inside of the condensation line and reduces the furnace's ability to rid itself of excess water that has been created as a result of the function of the heating elements inside the furnace. Fortunately, checking and cleaning the condensation line is a simple process. Furnaces often have plastic or vinyl condensation lines. 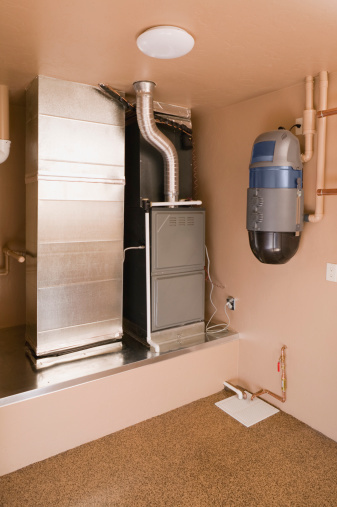 Locate the condensation drainage line coming from your furnace. On most Bryant furnaces, this will be located in the lower section of one side of the furnace. The drainage line will be made of either white PVC pipe or clear vinyl tubing and will run to a drain or sump pump nearby. Turn off the furnace at the breaker. Open the panel nearest the condensation line, being careful to not pinch or tear the condensation line. Follow the condensation line to a small box or drain located near the blower unit. Check proper drainage of the unit by removing the condensation line, placing a catch pan under the drain and running the furnace. Condensation should begin to drip out of the furnace, but timing will vary by climate and weather. You should see something within 15 minutes, but keep in mind that you are looking for condensation, so there may be very little liquid even if the furnace is running properly. Clean the condensation line by blowing some hard blasts of air through it with an air compressor fitted with an appropriately sized attachment to dislodge excess buildup. If the buildup is very thick, replacement of the line may be necessary.